See more images in Flickr. 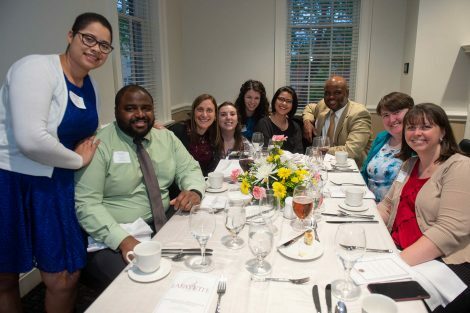 Outstanding professors and other members of the Lafayette community were honored for distinguished teaching, scholarly research, and service to the College at the annual pre-Commencement awards dinner Friday night. 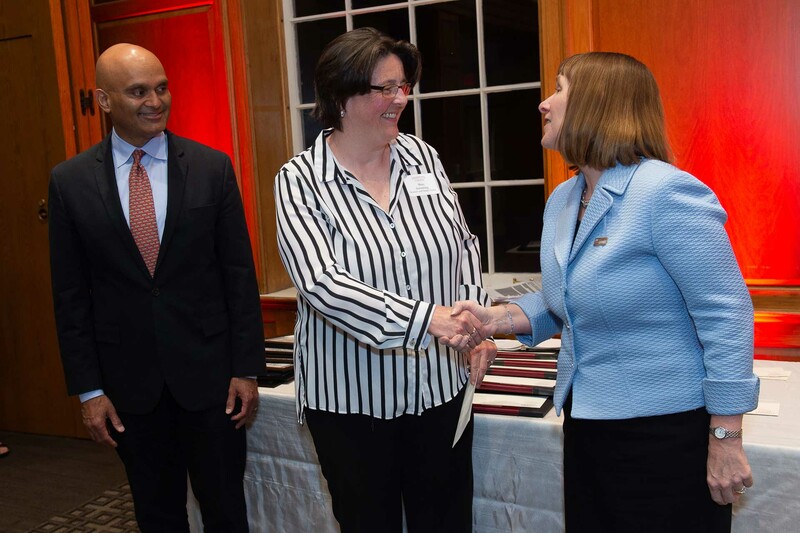 President Alison Byerly, Provost Abu Rizvi, and Edward Ahart ’69, chair of the Board of Trustees, presented awards and citations. 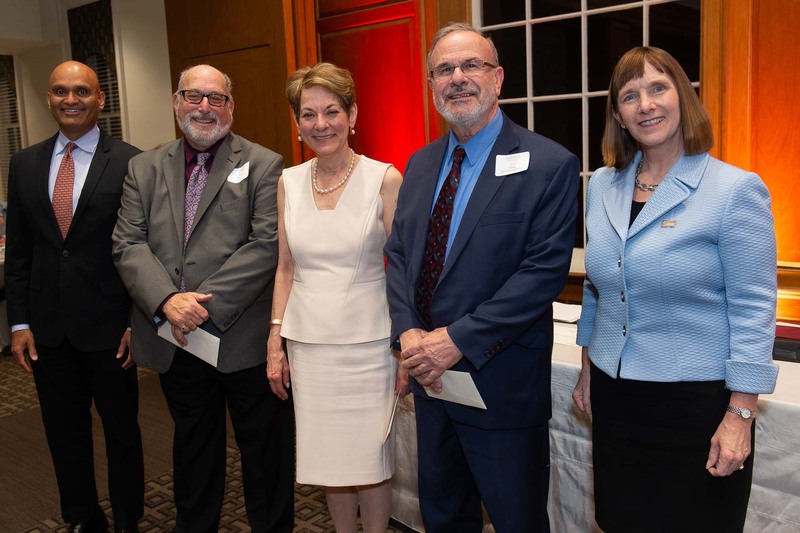 Byerly recognized retiring members of the faculty who have been elected to emeritus status. They are Brad Antanaitis, associate professor of physics; Roxanne Lalande, professor of foreign languages and literatures; Don Miller, John Henry MacCracken Professor of History; and Lorenzo Traldi, Marshall R. Metzgar Professor of Mathematics. Byerly also recognized members of the administration who have retired this year: Laurie Chisesi, senior associate director of financial aid; Charles Crawford, director of human resources/benefits; Marie Enea, executive assistant to the president; Karen Forbes, director of the Counseling Center; Linda Jroski, procurement manager; Donna Krivoski, director of parent and family relations; Jim Krivoski, vice president and liaison to the Board of Trustees; Bruce McCutcheon, director of athletics; and Emily Schneider, executive assistant to the provost and special assistant and recording secretary to the Board of Trustees. Enea and Terese Heidenwolf, Skillman Library’s director of research and instructional services, were honored for 25 years of service to Lafayette. Byerly saluted Ahart, who is stepping down as board chair after serving in the role since 2010 and will remain a trustee. 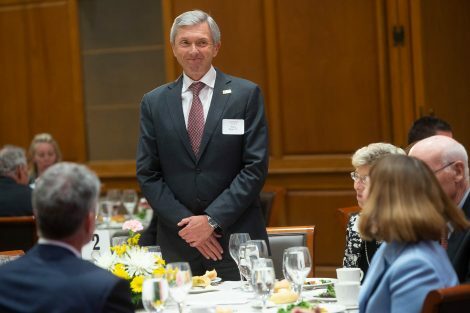 Ahart recognized trustees Steve Pryor ’71 and Sylvia Daniels Weaver ’75, who are retiring from the board and will be elected to emeritus status. He announced that Lisa Kassel ’79 P’13, Jeff Kirby ’84, and Jose “Tony” Rodriguez ’84 will be elected or re-elected to the board. The evening featured the awarding of prizes in recognition of exceptional teaching, scholarship, and service to Lafayette. The awards are funded through designated gifts to the endowment. Marquis Distinguished Teaching Awards went to Deborah Byrd, professor of English; Laurie Caslake, professor of biology; Rebecca Kissane, associate professor of anthropology and sociology; and Stephen Kurtz, associate professor of civil and environmental engineering. The awards were established by Walter A. Scott ’59 and his wife, Kate. Andrea Smith, professor of anthropology and sociology, received the Mary Louise Van Artsdalen Prize for outstanding scholarly achievement. The award was established by Dr. Ervin R. Van Artsdalen ’35 in memory of his wife. 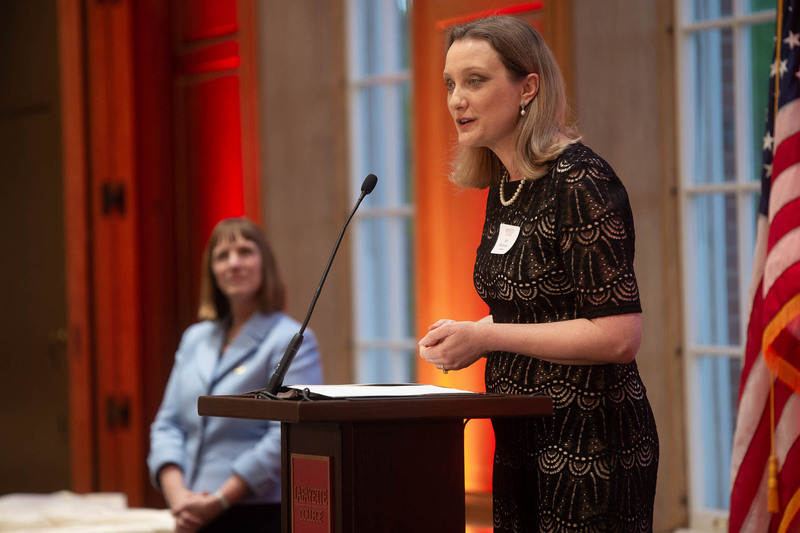 Angelika von Wahl, associate professor of international affairs, is the recipient of the James E. Lennertz Prize for Exceptional Teaching and Mentoring. Established by Leslie Muhlfelder ’81, the College’s vice president for human resources and general counsel, the award honors Lennertz for exceptional teaching, devotion to students, and extraordinary ability to challenge students to realize their full intellectual potential. Rachel Goshgarian, assistant professor of history, is the recipient of the Delta Upsilon Distinguished Mentoring and Teaching Award. The award was established in 2000 by alumni of the Lafayette chapter of Delta Upsilon fraternity on the 115th anniversary of its founding. 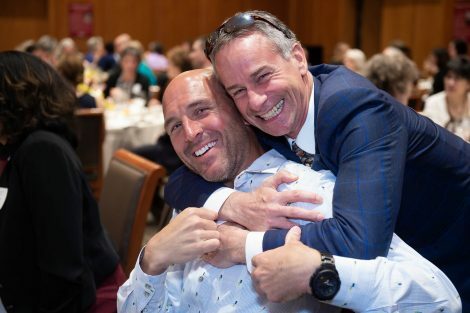 It recognizes members of the faculty for distinctive and extraordinary teaching through mentoring, which may include advising, undergraduate research, independent study, or any of the many one-on-one mentoring activities that take place in a student-centered learning environment. Elaine Reynolds, associate professor of biology, received the James P. Crawford Award for demonstrating a high standard of classroom instruction. Established by Jonathan Bernon ’84, the award honors the late James Crawford, who taught in the Department of Mathematics from 1957 to 2003. The B. Vincent Viscomi Engineering Prize for Excellence in Mentoring and Teaching was awarded to Lauren Anderson ’04, associate professor of chemical and biomolecular engineering. Viscomi, Simon Cameron Long Professor Emeritus of Civil and Environmental Engineering, taught at the College for 41 years, including 14 as head of civil engineering. Margarete Lamb-Faffelberger, professor of foreign languages and literatures, received the Christian R. and Mary F. Lindback Foundation Award for excellence in teaching and outstanding contributions to campus life. Lisa Gabel, associate professor of psychology, received the Carl R. and Ingeborg Beidleman Research Award recognizing excellence in applied research or scholarship. 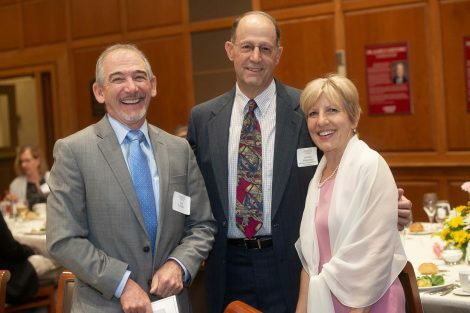 The prize was established by Carl R. Beidleman ’54, professor emeritus of finance at Lehigh University, and his wife, Ingeborg. David Stifel, professor of economics, received the Thomas Roy and Lura Forrest Jones Award for superior teaching and scholarly contributions to a discipline. 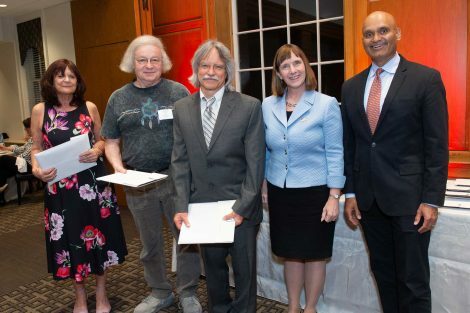 Michael Butler, assistant professor of biology, and Nandini Sikand, associate professor of film and media studies, received Thomas Roy and Lura Forrest Jones Faculty Lecture Awards in recognition of excellence in teaching and scholarship. Each will deliver a featured lecture during the 2018-19 academic year. The Faculty Award for Distinguished Leadership in Community-Based Teaching and Research was given to Deborah Byrd. The Faculty Award for Excellence in Community Engagement Pedagogy went to Lauren Meyers, assistant professor of psychology. Rachel Koh, assistant professor of mechanical engineering, received the John T. McCartney Excellence in Diversity Education Award. Robert Blunt, assistant professor of religious studies, and David Mante, assistant professor of civil and environmental engineering, are the recipients of Student Government Superior Teaching Awards. The Council of Lafayette Women received the Daniel H. Weiss Award for Leadership and Vision. 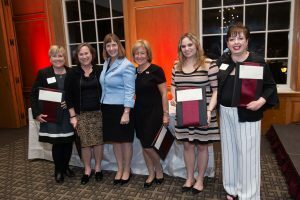 It was accepted by Ellen Poriles Weiler ’83, chair of the council, Sandy Kazinski ’85, Barbara Levy ’77, Katie Livornese ’14, and Rachel Nelson Moeller ’88, executive director of alumni relations. 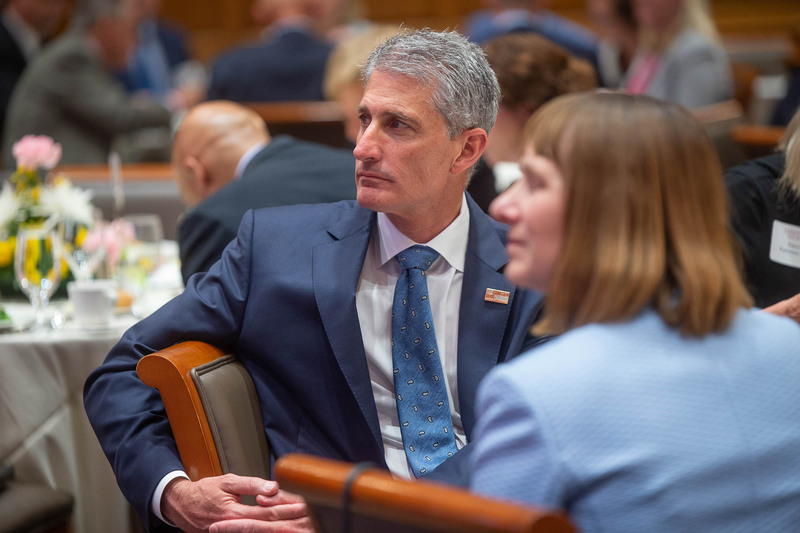 Established by Michael LeWitt ’70 and Lynne LeWitt P’13, the award is presented annually to a Lafayette-related individual or group of individuals who have demonstrated leadership and vision. 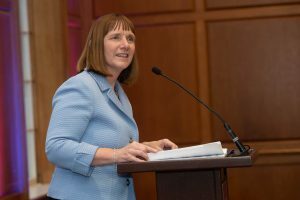 Donna Krivoski is the recipient of the Gary A. Evans Administrative Prize, presented to an administrator or staff member who has provided a high level of service to the College, its alumni, or students over a substantial period of time. The award was established by an alumnus in tribute to the extraordinary service of Gary Evans ’57 to Lafayette over more than three decades, including positions as director of admissions, vice president for college relations and development, and executive assistant to the president. 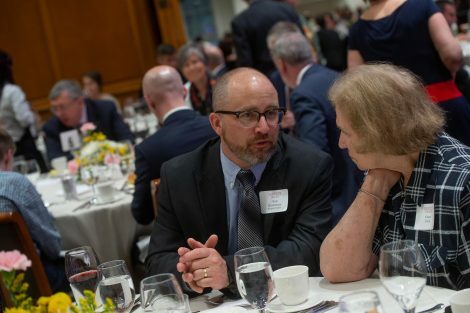 Simon Tonev, director of institutional research, received the Cyrus S. Fleck Jr. ’52 Administrator of the Year Award in recognition of outstanding contributions to the campus community. 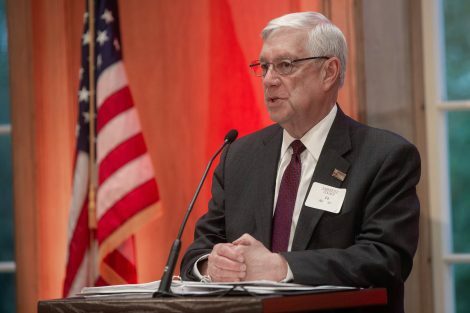 Cy Fleck, for whom the award, instituted in 2002, is named, served Lafayette as an administrator for more than four decades, including 32 years as registrar. Recipients of the Distinguished Service Award, recognizing sustained, distinguished performance by members of the support staff, plant operations, public safety, and administrative staff, are Ester Barias-Wolf, collections and FACS technician, Skillman Library; the Rev. Alex Hendrickson, College chaplain and director of religious and spiritual life; Paul Miller, visual resources curator; Cynthia Notaroberto, administrative coordinator for the film and media studies program and theater department; and Nancy Williams, assistant to the provost. Hendrickson, Miller, Notaroberto, and Williams received their awards this evening. Barias-Wolf will be acknowledged at an event later in the year. Kaity McKitrick, deputy director of athletics and senior women’s administrator, received the Maroon Club Athletic Staff Achievement Award. 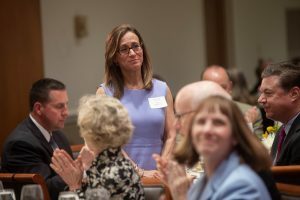 The award is given to a full-time athletics department staff member who has demonstrated outstanding service to the College and its athletics program. Mary Armstrong, Charles A. Dana Professor of Women’s & Gender Studies and English, received the Daniel L. Golden ’34 Faculty Service Award in recognition of distinguished service to Lafayette through the Alumni Association and alumni activities. 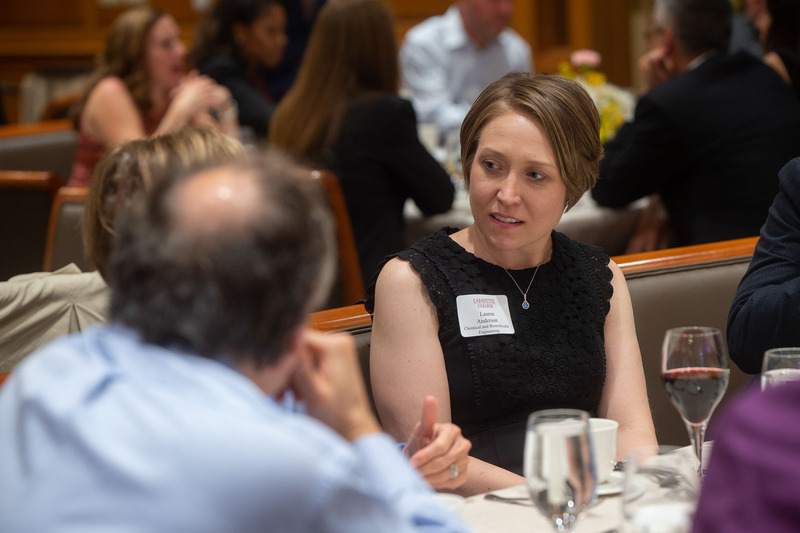 A number of faculty promotions will take effect with the 2018-19 academic year. Steven Belletto (English), William Bissell (anthropology and sociology), Sidney Donnell (foreign languages and literatures), and Arthur Kney (civil and environmental engineering) have been promoted to full professor. The following have been promoted to associate professor with tenure: Robert Blunt (religious studies), Michael Butler (biology), Il Hyun Cho (government & law and Asian studies), Michael Feola (government and law), Nestor Gil (art), Rachel Goshgarian (history), Jeffrey Liebner (mathematics), Michael Nees (psychology), and Daniel Quiros (foreign languages and literatures). Jon Wallace (associate professor, electrical and computer engineering) has been granted tenure.